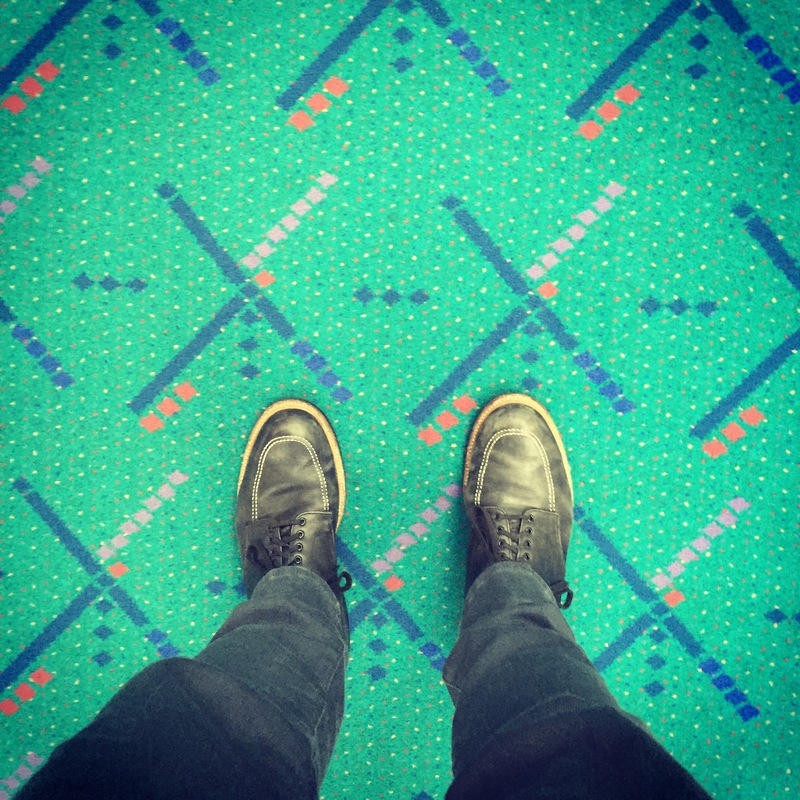 Portlanders have a tradition when visiting their airport: taking a picture of their feet. It’s not to show off their shoes, but rather, what’s under them. 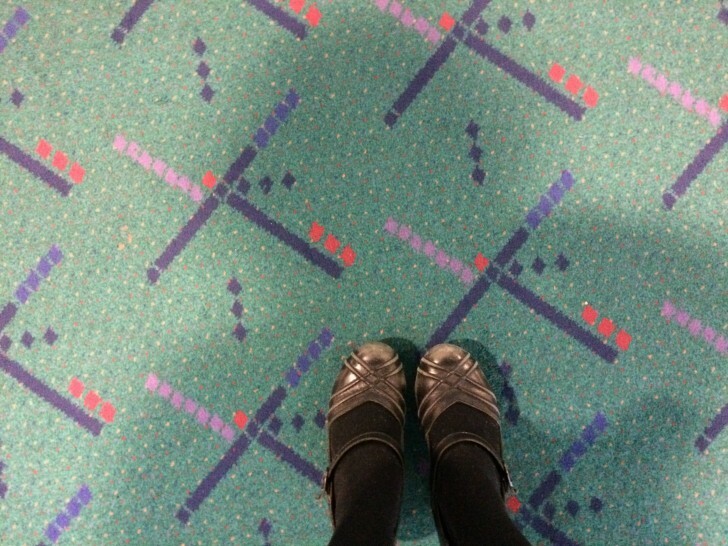 They are documenting the famous PDX airport carpet. The PDX carpet is a loud, decidedly 80s geometric pattern over a vast sea of teal. The carpet, it is said, is based on the way the runways and lights look from the air traffic control tower; another story has it as representative of the air traffic control radar screen. Wherever the design comes from, one thing is for sure: the carpet is very, very beloved. 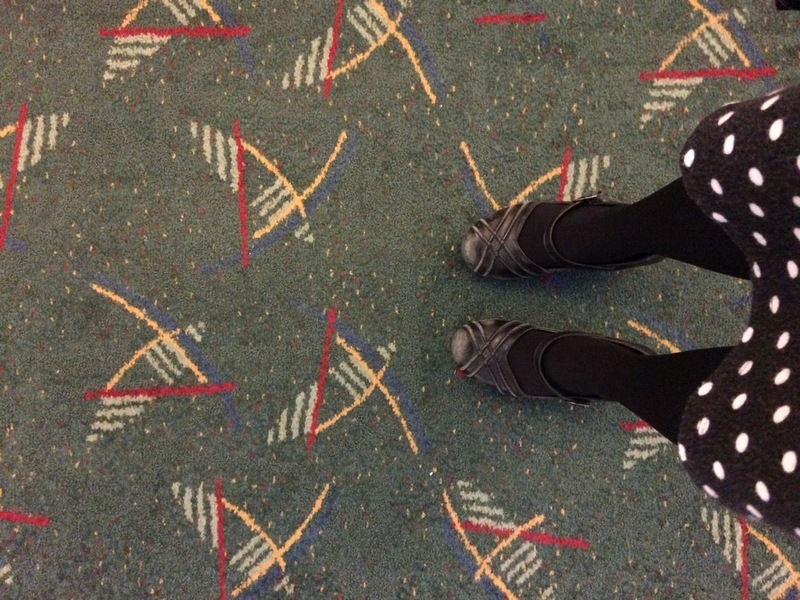 There are even signs in the airport now saying, “Tweet your feet!” and an official #pdxcarpet hashtag. 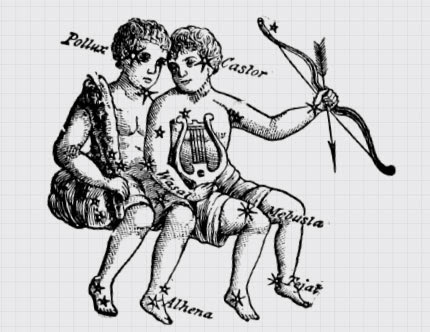 The carpet has inspired some Portlanders, incuding Emma Milkin, to get a tattoo of the design. 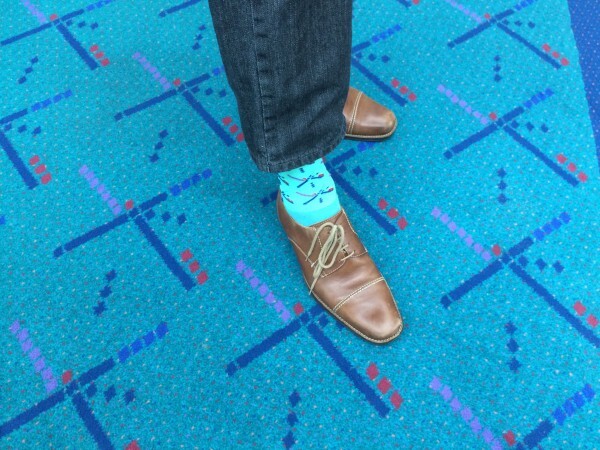 Another Portland resident, Jeremy Dunn, created PDX carpet socks. Now, shops at the PDX airport sells all kinds of wares emblazoned with the carpet pattern: t-shirts, coffee mugs, throw pillows, tote bags, stickers, key chains, bike helmets. 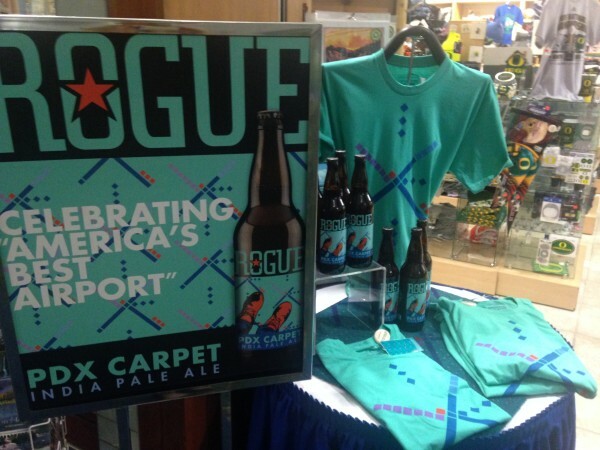 There’s even a PDX Carpet IPA from Portland brewery Rogue. It is beloved by locals and having buy-in from the airport itself. But even so, the carpet’s days are numbered. The carpet is being replaced. Work crews use a machine called a Panther to tear up the old carpet. With thirteen acres to clear, the airport projects that the old carpet will be out by November 2015. Four 1000 square yard pieces will be made available to businesses or individuals with a plan for how to keep the pattern alive. 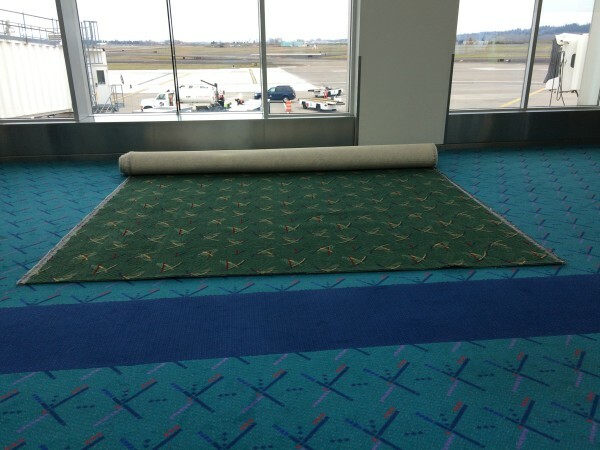 But in the PDX airport, the carpet will disappear. No, the carpet will not be replaced with the same beloved pattern. The decision to replace the carpet was made back in 2008, before all the foot selfies and #pdxcarpet. The new design is reminiscent of the old carpet, but it’s a darker green and has a more intricate pattern. The busyness of the new design actually help hides dirt and other wear and tear. In fact, there’s an extra-busy version of the new design that PDX will lay in higher-traffic areas. So far, Portlanders are far less enthusiastic about the new floor pattern. 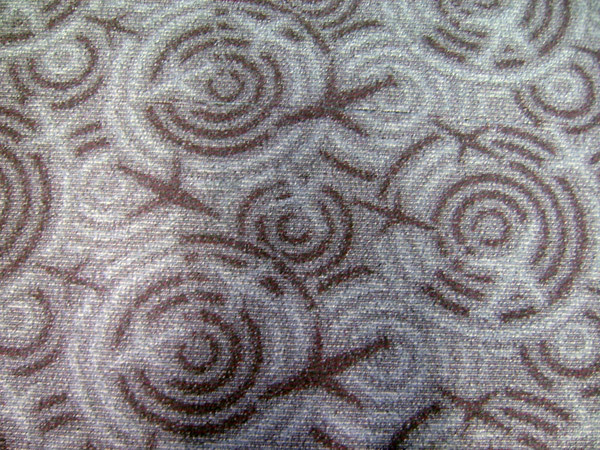 You just can’t manufacture a cult following for an airport carpet. It has to happen on its own. 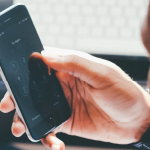 This story was reported by Julie Sabatier, host of the podcast Rendered (formerly Destination DIY). Julie spoke with carpet superfan Emma Milkin; Jeremy Dunn, designer of PDX carpet socks; Robin McCaffrey, engineering project manager at the Port of Portland; Mike Mackley of 4M Floor Covering, and Michelle Vo of Hennebery Eddy. The new carpet seems to have a windsurfing motif. Intentional? LOL! “You ruined EVERYTHING!” Totally. @Merlin – I think it’s supposed to be evocative of the canopy outside the front of the terminal building rather than windsurfing. Thank you for doing a podcast on this! And now Victor Papanek? The colour and busyness of the new carpet makes it look dirtier than the old carpet already. @Julia !!!!!!! I would love a Victor Papanek podcast !!!!! This is best idea I’ve heard in a while. I’m Either about Victor directly, or about Nomadic Furniture. Personally I love the Dayton Ohio(home to the Wright Brothers) airport carpet. It is easy for me to say as some one who has never flown into or out of PDX, but I actually like the new design better. I think it is nice homage to the old design, with a more pleasant (and functional) background. I also like that new design has a little more movement to it which seems appropriate for an airport. 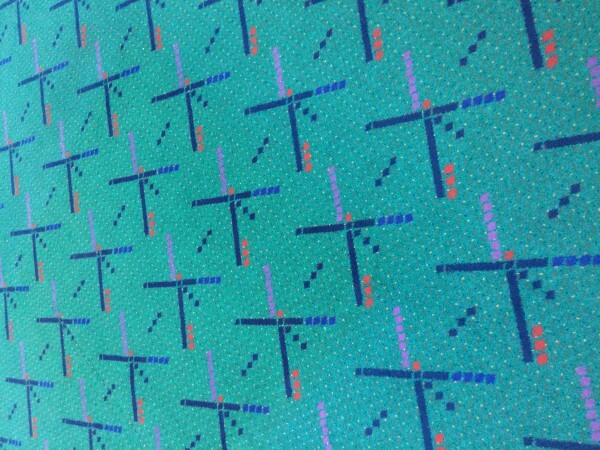 I’ve always loved PDX though I’ve never been in love with the old carpet design. 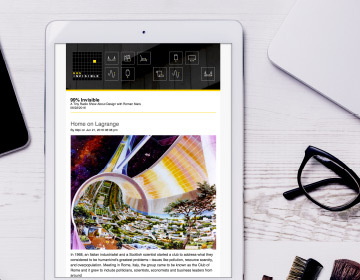 But the new design… eek! Chaos! Hmm…have to say I really don’t like the new design. Old design is pretty great though, sad they didn’t decide to keep it. Thinking the carpet designers and vexillographers should have gotten together when designing the carpets. Does PDX have its own flag? Does anyone know the music at the opening of the episode? This episode was awesome! It’s so true that an organisation / ad agency couldn’t attempt to create such a following. It has to be driven by user content. So cool. The new design screams 1990 dead mall to me. The carpet at Phoenix Sky Harbor Airport has tiny airplanes in a holding pattern, or possibly a dust storm? I don’t know that the pattern is beloved, or that anyone even notices it. I would love to hear an episode about the design theory of casino carpeting! Great episode, keep it up! I have an idea that could solve the whole problem. Looking for the contact information for the woman who handles the new carpet project…. What is the name of the song at the end of this episode? The one playing while Roman reads the credits. For some strange reason I find myself drawn towards the design of the old carpet. Almost like it’s an alien sign or message that if I stare at long enough it’s hidden meaning will become clear! I expanded a picture of it on my tablet and placed it on my floor. I now have my own 7×5 inch remnant! Jar Jar Binks was not the worst part about that movie… However, all the crazy awesome design that went into the movie is pretty dope. Don’t hate bro. everyone should check out @ihavethisthingwithfloors on Instagram. If the original carpet showed too much dirt I don’t understand why they couldn’t of just created a new design that kept the same geometric pattern but placed it on a darker background like a darker blue, a black or a dark gray. The color of the pattern could of stayed the same except lighten the dark blue “runway” lines to maintain visual contrast with a new darker background. The carpet would of maintained a consistency with the original theme and looked even more like a night time view. Just listened to this episode. 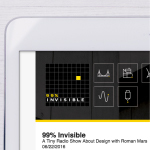 Check out this news from last week. The PDX carpet will be grand marshal to one of our parades in Portland. It does make a cool tat. I made the short film! Oh geez. Hipsters and their arbitrary attachments to things like old ugly carpet. I didn’t know about the cult following but I love the wacky old carpet. I’ve been away from Portland for 2 years and I’m somewhat sad that when I finally come back the carpet will be replaced by one with a far worse color scheme. lol. They touched on this a bit, but I feel like it’s really important to explain the sense of affection and attachment many Portlanders have to their city. It’s not just saying “Look, I’m doing the thing!”- It’s telling your social media network that you’re home and you’re so happy to be back. 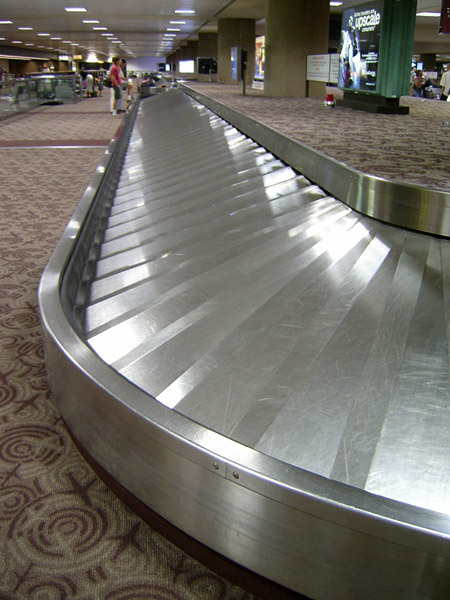 There’s also the fact that PDX is rated one of the best airports consistently. Ha ha. I’m not big into things like this normally, but I always do the foot selfie out of appreciation for my return to my beloved city. “It’s not to show off their shoes, but rather, what’s under them.” That first pic looked like a pair of Alden Indies. If I could afford those bad boys, I would be taking pictures of my shoes anywhere and everywhere.